The Petroleum Engineering program was developed to prepare scientists and engineers to be able to produce novel technological solutions for enhancing recovery of the existing hydrocarbon sources (secondary and tertiary recovery methods) and developing new methods for recovering unconventional hydrocarbon reserves (tight oils, heavy oils, bituminous sands, oil shale, gas hydrates, etc.). Relevant bachelor’s degree, or its equivalent in Physics, Mathematics, Geology, Petroleum Engineering and IT. 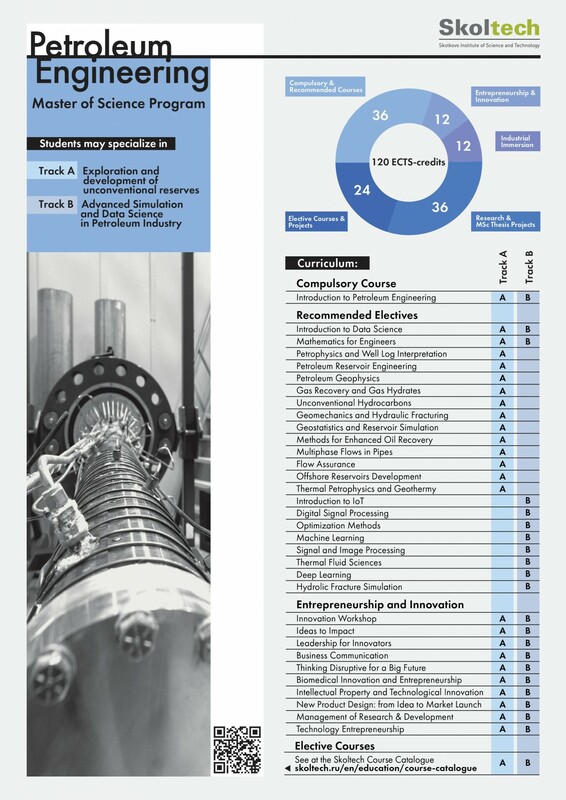 The main scope of the Petroleum Engineering program is to train students in the fields of exploration and development of hydrocarbons, with a focus on fundamental knowledge and competency to carry out experimental and theoretical research to develop new technologies relating to hard-to-recover and unconventional reserves. The master’s program includes student immersion into the oil and gas production industry, execution of real-life projects in production and service companies, execution of scientific research in the Skoltech Center for Hydrocarbon Recovery together with its partners: leading universities in this sphere from Russia, Europe, USA, Canada and Great Britain. See here additional info of the courses and modern hydrocarbon recovery technologies (in Russian). View the outstanding laboratory of the Center of Hydrocarbon Recovery. Students graduating with a Master of Science degree in Petroleum Engineering are in great demand throughout the international Oil&Gas market.